, we’ve yet to detail the new Malibu Hybrid– until now. , which is much welcomed news. With the Volt’s advanced technology the new Malibu will offer an estimated 4.9 L/100km city, 5.2 L/100km highway – and 5.0 L/100km combined. That means it will deliver the best fuel economy in the segment, according to GM President Dan Ammann. “Fuel efficiency is important to our customers, especially in the midsize segment and with an estimated 4.9 L/100km city rating, the Malibu Hybrid delivers,” Ammann said. Under its re-sculpted bodywork sits an all-new direct-injection 1.8L 4-cylinder engine, mated to a two-motor drive unit (reworked from the Volt). Like the Volt, the drive unit in the Malibu Hybrid also provides additional power to assist the engine during acceleration, for a combined total of 182 horsepower. It also features an 80-cell, 1.5 kWh lithium-ion battery pack, which can can get the Malibu Hybrid up to 88kp/h on electricity alone, without the engine. The gasoline-powered engine will automatically come on above 88kp/h, or during rapid acceleration at low speeds in order to provide additional grunt. 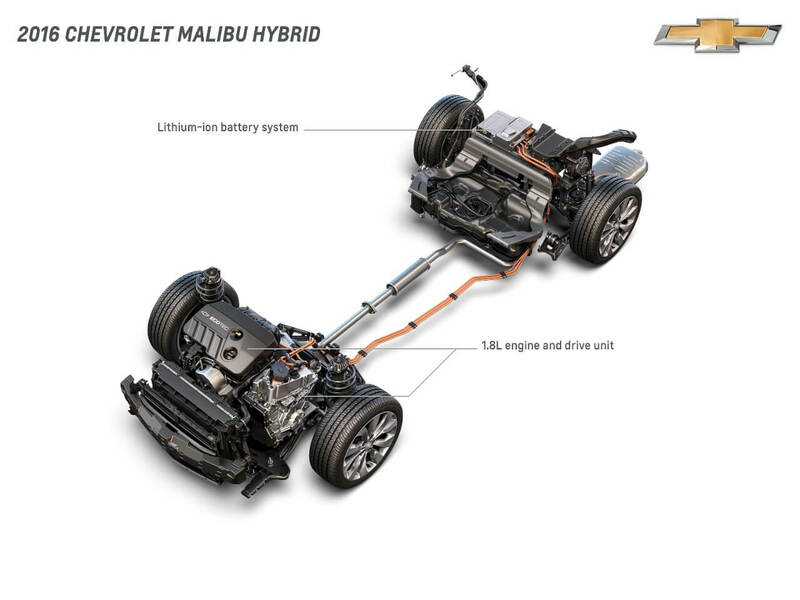 The Malibu Hybrid also features the Volt’s regenerative braking system, which stores energy lost in the process of braking and translates it back into energy to be stored in the battery pack. In other words, you add slightly more energy back into the battery pack each time you put your foot on the brake. The Malibu Hybrid will be manufactured in Kansas City at the Fairfax Assembly plant and it is due in Chevrolet dealer showrooms next spring.